ADVENT CALENDAR 2016: looking for an inspiration to create one? This is our idea for it: simple, made with love and with a green soul. 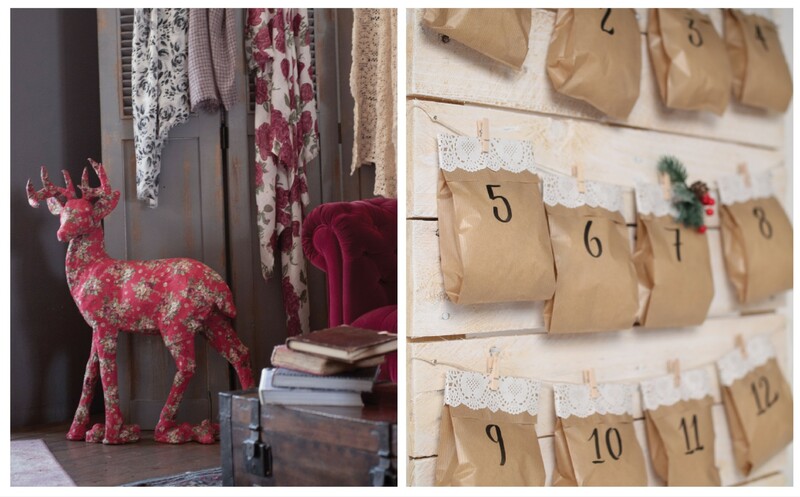 Here are the 7 steps to make your own home-made advent calendar. Imagine a cold december afternoon. Steam rising from your favorite tea blend and a huge woollen shawl warming you up in a soft hug, while outside the weather doesn’t look too good. It’s one of those days everything went just the way it was supposed to, no problems nor accidents. So finally, after a very long time, you have a moment all to yourself that you can dedicate to making something creative and special. It’s less than a month to Christmas, then why not think about creating an advent calendar that has your touch, a cuddle to accompany the whole family up to Christmas with many small precious gifts?! I. Every advent calendar is made up of 25 sections: one for each day from the 1st to the 25th of december, a mix of surprises and loving thoughts leading the way up to Christmas. Start with writing on each paper bag the number of the corresponding day. We’ve used a black marker, but you can also pick an intense color, like red, perfect for this time of the year. II. Starting the day with a little surprise makes it all more special: choose 25 small but precious objects to put inside the paper bags. A personalized bracelet or a pendant to always carry with you, a caring thought to wish your boyfriend the best of days, some chocolate to make the morning sweeter or special words for your loved ones. III. Now all you have to do is close the bags: make a 2 cm flap on top and close it with the help of double-sided tape or a stapler. The Vestopazzo touch? Make all the bags unique by decorating them with white lace paper strips. This will give a shabby and romantic look to your advent calendar. IV. Now it’s time to prepare the support base of your calendar. Take our advice and use a wooden pallet: a great idea to recycle creatively! You can choose to leave it as it is, or to personalize it with the paint you prefer. V. After fixing a few small nails at each end, pull a twine string from one side to the other, so to create as many supports as necessary for the 25 advent calendar bags. VI. Easy right? We’re almost there. Now fix the paper bags on the string using small wooden pegs. If you want to make your advent calendar even more cheerful you can pick some colored ones. VII. We like to think that all we create says something about us, this is why the last step, the one dedicated to the decorations you will apply on your advent calendar has no rules. Pick the ones you like most: small berries or mistletoe, cinnamon sticks, glitter or Christmas stickers. Personalize your advent calendar and let it say something about you! Which jewelry piece should you choose for the 25th? The necklace microspheres of the Love Silver Collection, made in metal silver-plated and with a leaf pendant.